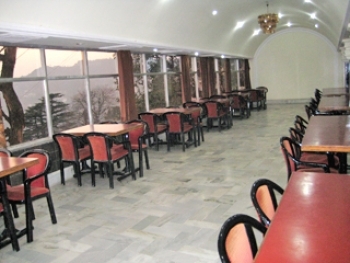 Mall Palace is a budget hotel in Mussoorie, providing comfortable accommodation and modern facilities to the guests. The warm hospitality, delicious food, modern facilities and scenic views makes it an easy winner among the travellers. The hotel ensures memorable stay to the guests and meets the needs of discerning travellers. Hotel Mall Palace is conveniently located on the famous Mall road and maintains 25 rooms to stay in. An elevator on the side of the lobby takes you to the rooms located across floors in the building. Hotel Mall Palace is located on the Mall Road of Mussoorie, opposite the Ropeways. Some nearby tourist places from hotel are: Kempty Falls is 14 kms, Lake Mist is 12 kms, Tibetan Temple is 5 kms, Company Garden is 4 kms, Lal Tibba: 4 kms, Dhanolti Forest is 28 kms, Surkhanda Devi is 35 kms, Mussoorie Lake is 6 kms, Bhatta Fall is 9 kms, Wonder World is 500 mts, Ropeway to Gunhill is 500mts, Fish Equarium is 100 mts. Hotel Mall Palace in Mussoorie offers accommodation in Deluxe, Super Deluxe and Luxury Rooms to the guests. All the rooms are spacious, clean and equipped with modern facilities. The hotel offers breathtaking views of the valley. The Super Deluxe room is well appointed with a dressing table, luggage rack and seating area. There are two types of Deluxe rooms, one with Terrace and other with Balcony. 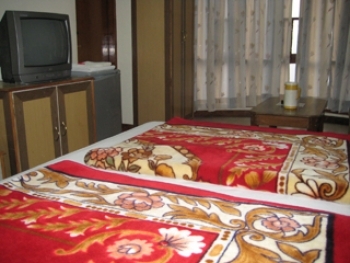 The Luxury room is large and provided with the same amenities as the Super Deluxe room has. The attached bathroom of Luxury Room also has a bathtub. Hotel Mall Palace has a multi cuisine restaurant on the first floor, facing the picturesque valley. The restaurant is open for breakfast, lunch and dinner, offering appetizing Indian, Chinese and Continental cuisine. The nearest railway station is at Dehradun, 32 kilometres away and the Jolly Grant airport is 42 kilometres away form the hotel Mall Palace. Please Note: The hotel is providing extra mattress in place of extra bed for extra person. Vehicular access to Mall Road is restricted. From 8 am to 5 pm, private cars are allowed on the Mall at a charge of Rs.100, while taxis are allowed access to the Mall only between 10 pm and 8 am (free of charge). During the day, rickshaws are available for commuting from the taxi stand to the hotel.